Skyscrapers are abundant particularly in international cities. Austria is not to be outdone and it’s highest tower is located, where else, but in the capital city of Vienna. Called the DC Tower, the building is situated by the Danube River giving occupants a beautiful view of this famous body of water. It was designed by architect Dominique Perrault. A total of 60 floors are in place while 93,600 square meters of space are up for rent. The lifts feature advanced technology in that it has touch screens and a computerized voice that bring people to the correct floor without having to press buttons. The first lucky residents of the tower include a cosmetic surgery clinic as well as a bar and restaurant at the rooftop which are scheduled to accommodate its first customers in February. The cosmetic surgery clinic is up there near the top on the 52nd floor occupying 300 square meters of space. It is owned and managed by a surgeon by the name of Artur Worseg who said that vanity was his main reason for booking a space in the DC Tower. He also hopes to attract wealthy clients particularly those coming from the Middle East and Russia. 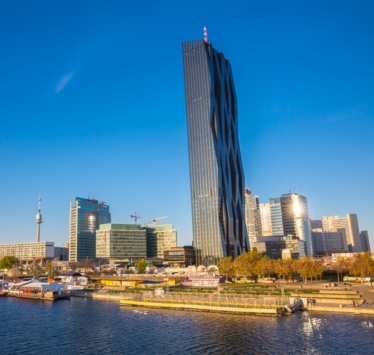 Apart from the DC Tower, the Millennium Tower is Vienna’s second tallest building with 51 floors and Austria’s fourth tallest. The others are the Donauturm and the chimney of the Simmering Power Station.